Here we have Claire & Charlie's new smocked dress with the Peter Pan crew!. 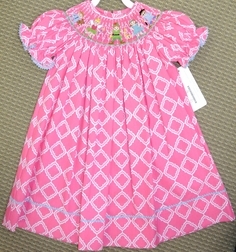 The dress is made of pink fabric with white geometric shapes and is trimmed with blue ric rac. The smocking is hand embroidered with Wendy and her brothers, Peter Pan and of course Tinkerbell. Love it!